ILR Communications and Marketing has established an ILR calendar for internal use that provides a big-picture look at events going on schoolwide. You’ll be able to easily access the calendar and enter event information yourself, at any time. What kind of events will be included in this calendar? Will I be able to enter event information directly to the calendar? Yes, we want to encourage everyone to enter events as you become aware of them. Access the ILR Calendar following the steps above. Once you’ve accessed the calendar, you’ll follow the same process you would for scheduling a meeting. Go to the date of your event, double click on the time, and enter the information. Include as many details as possible (title, date, time, location, description, event contact). Start Time: 11/3/2015 4:30 p.m.
End Time: 11/3/2015 5:30 p.m.
Once you have finished entering the information, click on the save/close button and your event will be added to the calendar. Notify ilrevents@cornell.edu immediately of any cancellations or date/time/place/content changes. When can I start using this calendar? The calendar is live, so you can submit information immediately. 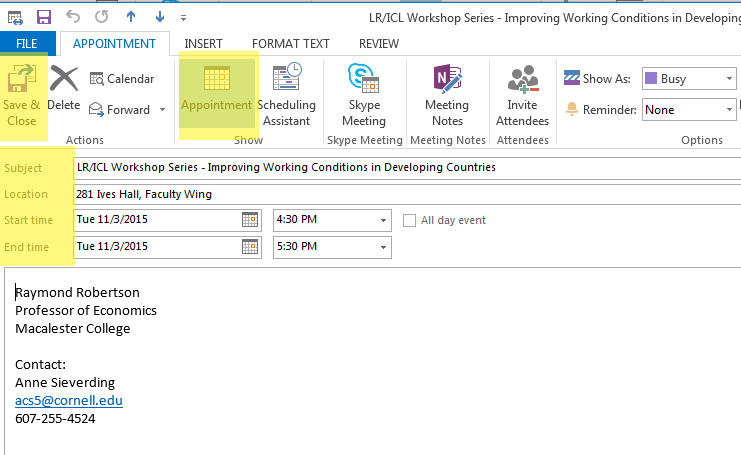 If I submit something to the internal calendar, will it automatically be entered into the ILR and Cornell calendars? This calendar does not feed to the central university calendar or the ILR Web page calendar. If you submit to this internal calendar, Joanne can make sure the information is entered into the Cornell and ILR events calendars, if appropriate. If you are having difficulty entering information, please contact Betsy at 254-8941 or bw485@cornell.edu. You can also send event information to ilrevents@cornell.edu.